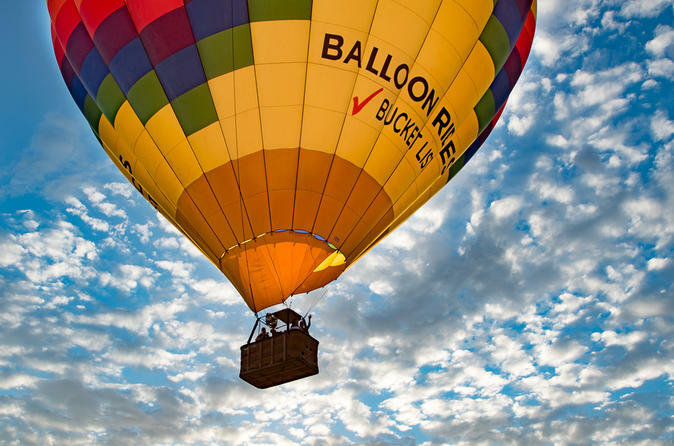 Enjoy the timeless Las Vegas skyline during a sunrise hot-air balloon flight as the sun comes up across from the Red Rock Mountains, admire the dramatic reds and oranges that fill the sky, and learn about the features of the Las Vegas landscape from your expert pilot. Back on the ground, celebrate a memorable flight with sparkling wine and a light breakfast for a perfect start to your day. The early morning adventure begins as you meet Rainbow Ryders at our corporate office. After check-in, you’ll step into our chase vehicles and be driven to one of our various launch sites. From there the pilots will begin the inflation process, giving you the opportunity to become an involved, “hands on” crew member as the gentle giants come to life. You may also choose to observe inflation and take pictures as the sun rises. Make sure you bring your camera! At lift off you’ll embark upon a journey of uniqueness. Get a gorgeous birds eye view of the Red Rock Mountains and the timeless Las Vegas Strip skyline. Prepare to be amazed by the gorgeous landscape and wildlife below as you float gracefully over the Vegas countryside for 45 minutes to an hour. After landing, enjoy a celebratory toast and post-flight refreshments to end your safe and memorable adventure. You will be presented with a flight certificate to commemorate your aeronautical experience.